Though the Brother MFC-9700 is a little large, and not really up to par with the printing and faxing speeds of the current market, it still has plenty of respectable features to offer a small business or home office that requires basic, no frills printing, faxing, copying, and scanning abilities. The paper handling abilities of the Brother MFC-9700 consist of a single 250 sheet tray for letter, legal, or other standard sized formats, and no multipurpose tray. Instead, users get a single sheet bypass slot that allows users to hand feed single envelopes, transparencies, card stock, and even checks, into a straight through paper path that allows for thicker media. 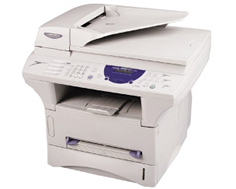 A small degree of fax functions are made available to users of the Brother MFC-9700. They include dual access, which is very convenient for busy offices that require their MFC to multitask, fax forwarding, paging, and remote access. The device is also capable of PC faxing which allows users to send information through a fax line, directly from their desktop by way of the MFC's built in modem. 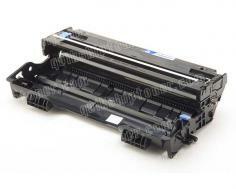 The first thing many look for in a multifunctional device or laser printer is a high print speed. The Brother MFC-9700, unfortunately, not only does not deliver, but not by a long shot. With only 15 pages per minute of both print and copy speed, your little sister's toy inkjet can produce more volume than this supposed work horse. Its fax functions are just as bad thanks to a very limited 14.4 to 2.4 Kbps modem that crawls along at a rate of only 5 seconds per page. In a world of Super G3 33.6 K modems, this old model doesn't cut it. On board memory is also very limited at only 8 MBs which partially explains why this unit has such limited power, and also ensures that any sort of complicated printing procedure will move even more sluggishly. There is no battery backup whatsoever in the Brother MFC-9700, which means important data is constantly at risk due to power failure or accidental unplugging of the unit. The device is capable of a very decent 600 pages of fax memory which could easily be lost by accident. The raw size of the unit is a downside in itself. With a massive footprint of 19.4 in. x 18 in. x 16.9 in. (W x D x H), users will find it harder to squeeze this cumbersome beast into smaller workspaces. It also carries a weight of 35.2 lbs, which is a great deal heavier than similar units available now. 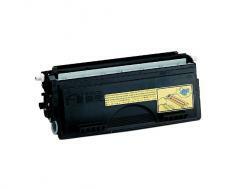 Review it: "Brother MFC-9700 "
The drum and toner cartridge setup for the Brother MFC-9700 is relatively inexpensive, and high page yields due to laser technology allow for up to five times the coverage per dollar than inkjets. This unit has high yield toner cartridges available that are cost effective, and can carry up to 6,000 pages worth of toner at 5% coverage, while the drum unit is good for up to 20,000 pages.